Awww this is both cute and sad to think about how each one turned out....Bellatrix (with the red rose) Crazy Insane Mad Woman,Andromeda (with the pink rose) Widowed Turned Away from her family, and Narcissa (with the blue rose) Quiet Confused but in the end Came Out On Top like Andromeda! Other than that I LOVE THIS! Yeah they really are cute. 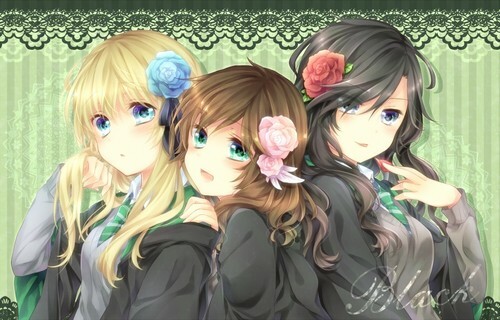 I think Narcissa (with the blue rose) is the most fortunate among the Black sisters. Sure both her husband and son are/were death eaters, in the end she still have both of them while Andromeda (with the pink rose) lost both her husband and daughter as well as her son in law in the war. As for Bellatrix (with the red rose), there's no hope for her. Sure she was a cute kid once. Everyone is cute and innocent when they were a child until something happens in their life that somehow turn them into what they are in the future. Sounds more like Snape's life doesn't it? But that's the truth. While some people are fortunate enough to have good people around while growing up, some are not very fortunate through their life thus turning them into mentally unstable people.